Air taxis will soon be hovering over Singapore's skies as trials are set to get underway in 2019. The Civil Aviation Authority of Singapore (CAAS) revealed on Tuesday (Apr 9) that initial trials with German company Volocopter will take place in the southern part of Singapore. Speaking at a media briefing at the Rotorcraft Asia trade show, CAAS’ deputy director of transformation programmes Mr Tan Chun Wei said that this will take place "over water". "We are going to take off where we land. For the first phase, it’s very much into experimental. For a start … it is going to be over water, and we are going to work with Volocopter on the safety aspects to ensure that even flying over water, it wouldn’t pose a public or even aviation risk. The landing spot will be somewhere in the southern part of Singapore," Mr Tan added. The air taxis from German aviation start-up Volocopter soon taking to the skies of Singapore will have "unprecedented levels of safety", said its chief executive Florian Reuter, with the company aiming to begin Singapore test flights in the third quarter of the year. Mr Reuter gave his assurance on Tuesday (April 9) that should any of their critical components fail, the Volocopter machines would still be able to "complete their mission" and arrive at their destination, owing to a design that has multiple components that run independently. "In order to be operating these vehicles in cities around the world, we need to be as safe as commercial airlines. That is the safety level that has been set for this vehicle," he said at the Rotorcraft Asia (RCA) 2019 and Unmanned Systems Asia (UMSA) 2019 exhibition held at the Changi Exhibition Centre. Mr Reuters showed several possible future routes that air taxis in Singapore could take. One is a 26km flight from Tuas to the Central Business District, while another is an 18km route from Changi to Sentosa. He also showed potential international routes such as a 26km route from central Singapore to Johor, and a 22km trip from Sentosa to Batam. The approximate cost of a 20km journey on a helicopter in the United States is $350. 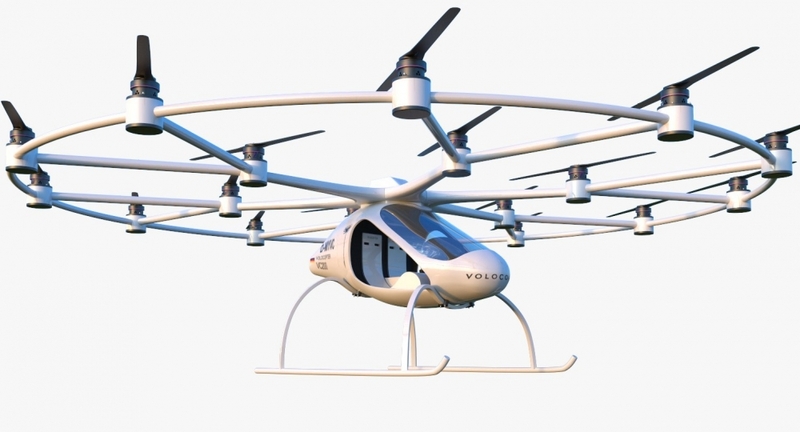 Volocopter's air taxis can take a maximum payload of 160kg and has a rate of climb of up to 3m per second. It has a maximum airspeed of 100kmh and at a cruise speed of 50kmh, it has a flight time of less than half an hour.